I knew at an early age that I wanted to be an artist. I actually started at the ripe young age of 2. I was drawing, painting and carving anything and everything I could, and probably on things I shouldn't have. I'm self-taught. I work primarily in oils. I like having the time to work the colors to get the effect I'm trying to create. I work in multiple layers, dry on dry, which means a lot of hours on a painting. I have studied art from its beginning 30,000 BCE to the present-day masters. 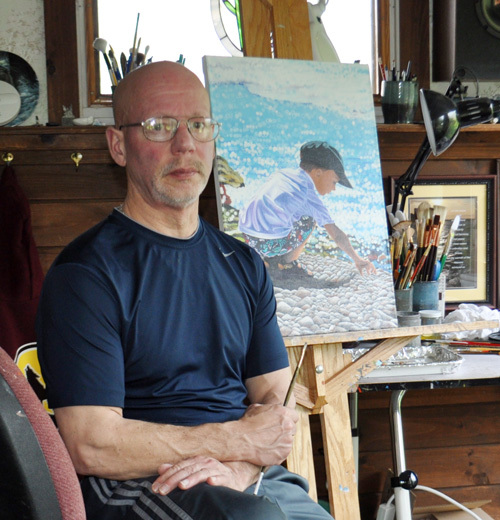 I worked in most mediums: acrylics, watercolor, pastel, graphite, pottery, sculpture and photography. I have studied and experimented with different techniques to come up with my own style, and I am still tweaking my technique. Where to artists get their inspiration from – everywhere? We as artists see the world differently. There can be beauty in almost anything if you look hard enough. A Jame McNeill Whistler quote: "An artist isn't paid for his labor, but for his or her vision." A vision is an act of seeing what in invisible to others. Creative people need to act on that creativity. We as artists are very passionate about what we do and it should reflect in the art we create. Just as in life, it is the little things that make a piece of art what it is! Art should be honest and reflect the artist's and subject's thoughts and moods. What do you see. The piece of art tells a story, and what story? One hundred artists could paint the same subject, and tell you100 different stories. In 2002 I injured my back badly enough so I can no longer work a regular job. There are different ways to look at it. I chose to look at the positive side. I can now do what I really love to do, create art on my terms. I now have a job I love. I really don't consider it work. I enjoy the whole process of creating a piece of art. Finding the right landscape, or just making one up. Working with models, and always asking "what if?" If you have any Questions about me or a particular painting please browse to my Contact Page and e-mail or call. Any reasonable hour. Thank you for the interest, have a great day!